El May is the nom de plume of LA-based Australian musician Lara Meyerratken. Her self-titled debut LP was self-released in 2010, and received organic radio support at major American stations with a number of tracks licensed for television (Pretty Little Liars, The Lying Game, Melrose Place) and film (Our Idiot Brother). Meyerratken’s impressive capabilities as a vocalist and multi-instrumentalist have been harnessed in the studio and on the road by a remarkable variety of artists, including Nada Surf, Luna, Crooked Fingers and Luscious Jackson. In addition to her work as a performer and recording artist, she composes music for film and advertising, and is a visual artist. Lara scored original music for Hank and Asha - a darling of the 2013-2014 independent film festival circuit. Her new album, The Other Person is You, is out now on Lojinx in Europe. 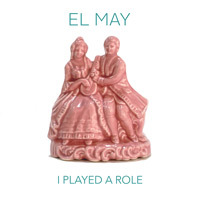 15 Sep 2014 El May’s “The Other Person Is You” is out today! 09 Sep 2014 El May UK Tour Dates! Enter your email address for El May related news & updates.